British Airways has partnered with the founder of the Rooftop Film Club, Gerry Cottle Jnr, to bring a summer programme of outdoor film screenings to consumers across the capital. 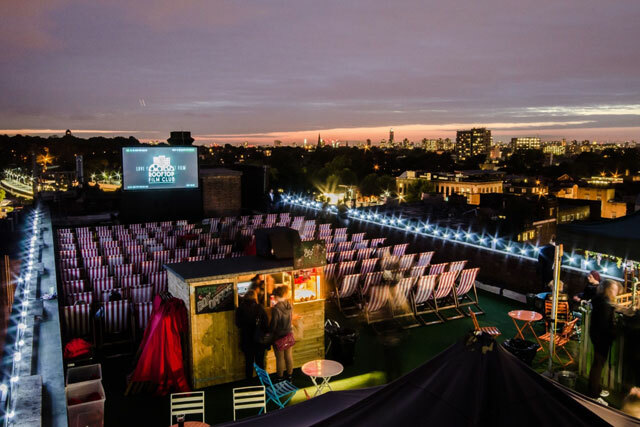 The pop up cinema club will offer consumers the chance to watch over 170 films while sitting on the roofs of Kensington Roof Gardens in West London, The Queen of Hoxton pub in Shoreditch, and the Bussey Building in Peckham Rye. The concept marries the Rooftop Film Club’s premise of giving the audience blankets and headphones while watching a film, with BA’s previous ‘Silent Picturehouse’ pop up film events, which saw BA crew members helping and serving consumers watching films while wearing wireless headphones. People can book tickets for a range of films from Dirty Dancing to Anchor Man II, Reservoir Dogs to Casablanca or The Lego Movie over the course of the summer at Rooftopfilmclub.com, and be served film inspired popcorn created by chef Simon Hulstone, who has worked with BA on similar projects. "We’re known for our headphones and blankets, which started as a way of not disturbing our neighbours," said Cottle Jnr, adding the format is an apt connection with BA’s ‘Silent Picturehouse’ concept, and with the brand’s in-flight experience, he adds. Cottle Jnr, son of the famous circus-owner, has been running the Rooftop Film Club for four years, and spoke positively of having a brand partner that is "actively involved" in the event. After having started life in the circus, Cottle Jnr worked in the PR and events industry for a number of years before starting his company. But a sense of creating a performance for people has stayed with him, he said: "Ironically I’m now selling popcorn and wanting to get bums on seats. "We’ve always said from day one that he cinema club had to be something for everyone – not too independent or too arty or too cool – because going to the cinema with us is about getting off the sofa and going somewhere with your friends." He added: "When I was younger I remember watching my father at one of his circus shows. He wasn’t watching the acts, he was watching the crowd smiling and I understood in that moment that he liked seeing people enjoy themselves, and I get immense enjoyment from seeing people have a good time." The Rooftop Film Club with BA starts from 1 May.